Firewall Live Wallpaper, available for Android through the Google Play Store, is an excellent free live wallpaper, and one that is a little bit more special than the many canned animation live wallpapers that are available. Firewall is a fractal that is ever-changing, meaning that you won’t see any animations repeat or loop, and the effect is very good, indeed. The effect looks at its best on a dark coloured phone or tablet, as the blackness really brings out the colour of the flames. The major worry with any live wallpaper is that it will majorly drain the battery, well I am happy to report that neither the phone or tablet I tested this on showed any exceptional decrease in battery life over any other live wallpaper I have used, and it is actually far less power-hungry than the stock Google live wallpapers that are included with every Android device. Firewall Live Wallpaper is a real-time generated OpenGL ES 2.0 animation. I’d like to stress, that it is NOT a slideshow or another silly looped movie. This is fractal based on 3D Perlin noise. You can spot similar paths of fire, but they are not the same. The app has a handy framerate adjuster to help with slower phones/energy consumption, and only works when you are actually on your homescreens to help save even more juice. There are three separate firewalls to choose from, so there is always something to match your screen and icons. Perhaps the very best thing about this, is that it is completely free, unlike many live wallpapers, and for that reason alone, it is worth checking out, to see how it goes with your phone and mood. 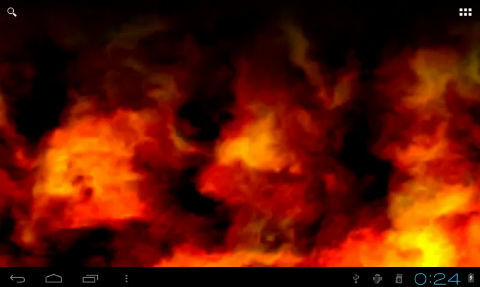 An excellent live wallpaper, Firewall is lovely to have on your phone.